Through thick mud and machine gun fire, some 700 runners took part in the annual PARAS’10 challenge in Colchester. 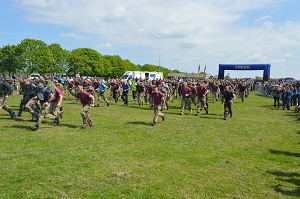 A mix of civilians, soldiers and dogs took part in the 10-mile run, which iscompleted as a cross-country race in trainers or as the P Company Challenge, wearing boots, trousers and carrying a 35lb rucksack – known as tabbing. The weather conditions were just right for The Parachute Regiment’s Red Devils freefall display team to drop in before the race started. 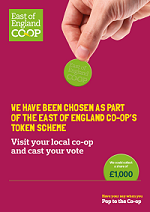 Every time a member shops at the Co-op, they’ll be given a token to put in the collection box of their choice. More tokens in our box means a bigger share of the £1000 for us! So please encourage your friends, family and supporters of the charity to choose us. On Sunday 29 May 2016 the Garrison Scout Group will be conducting a bag pack in order to raise donations for us. They will also be handing out leaflets to generate more awareness of the charity. If you are in the Colchester area and need to do any shopping make sure you head down and show them your support! Times: 09.30am – 4pmLook out for the Scouts at the front of the store or at the end of the tills. 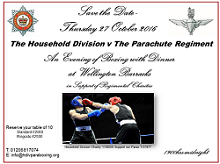 On Thursday 27 October a night of Dinner and Boxing will be held at Wellington Barracks, London, with the Parachute Regiment boxing against the Household Division. This is sure to be a memorable occasion. Contact info@hdivparaboxing.org to reserve your table of 10. What a way to see central London! The Vitality British 10K London Run is staged on the world’s greatest race route through the heart of Central London, passing many of the Capital’s truly world class historic landmarks. If you sign up to run with us you will recieve a free Support Our Paras goody bag on completion. Date: Sunday 10th July 2016 – We have 15 more places up for grabs! Contact: secretary@supportourparas.org or visit: Vitality 10k for more information or to sign up. Experience the adrenaline rush of tandem skydiving with the best in the business and raise money for us at the same time! If you’ve always wanted to do a sky dive what better way than with the Red Devils. John Mason will be holding the black tie Trinity Ball in support of 3 charities: SUPPORT OUR PARAS, Hire a Hero and Churchill Lines Charitable Fund. The evening will consist of a champagne Reception, dinner, a silent auction and a live auction with some superb prizes available. We are delighted that our recent application to take part in our Community Token Scheme has been successful! Collection boxes will be appearing in stores around Colchester on the 1st May and will run for three months until the end of July. 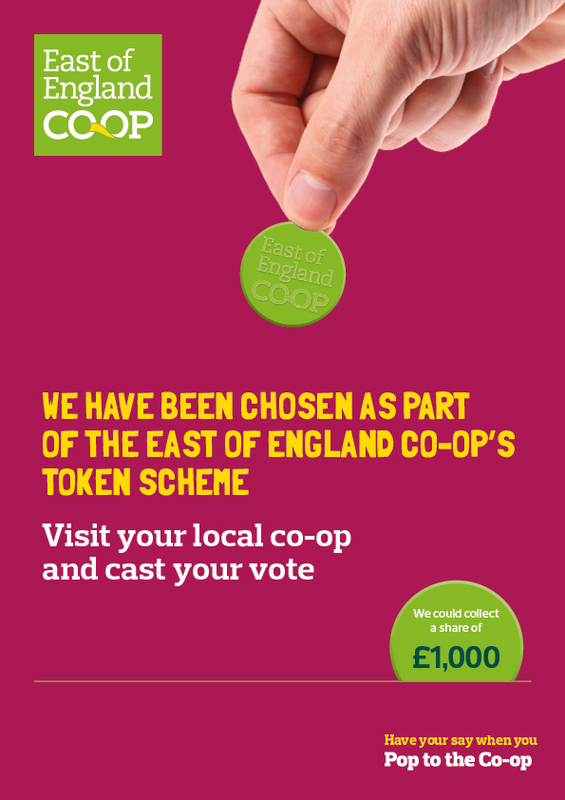 Every time a member shops at the Co-op, they’ll be given a token to put in the collection box of their choice. More tokens in our box means a bigger share of the £1000 for us – so please vote for us and encourage friends and family to do so. Less than 4 weeks until PARAS’10 Colchester 2016! Are you feeling brave? Want the experience of a lifetime? Collections: Get your hands on a Collector’s Packs and fundraise for us. It could be in your local area, business or event etc… Packs are made up of collecting boxes, seals, name badges, a t-shirt, Guide to Collections and an Authorised Collector certificate. Shopping: Shop via www.giveasyoulive.co.uk and raise donations at no extra cost to you. Shop normally at places like Amazon, Tesco, Dominos and a percentage of your spend is donated to the charity. Fundraising: The easiest way to collect is by setting up your own fundraising page on Virgin Money Giving. All you have to do is sign up, choose SUPPORT OUR PARAS as the charity you are supporting, add a photo and some background about what you’re doing and why. Then we can help promote it on our social media. Don’t forget to get your very own SUPPORT OUR PARAS wristband at the Airborne Shop for £2 inc. p&p. Profits from all sales made through the store go directy to SUPPORT OUR PARAS, so every purchase you make will directly benefit The Parachute Regiment. You might even find some more goodies along the way! The ultimate endurance race returns to Colchester on 15 May 2016 for it’s 5th year in a row. The race is open to both civilians and military personnel, with those taking part either running or tabbing with 35lb weight and boots. If you’ve not taken part before, now is the time! Don’t miss out on this fantastic challenge which will leave you with an amazing sense of achievement. Sign up at www.paras10.com to secure your place.